At approximately 3:00 AM on the morning of March 2, 2014, police responded to a report about a man trying to break into an ATM machine. This might seem like a pretty typical late night call, but the suspect in question had apparently decided to go the 'Lethal Weapon 4' route of committing crime...by donning full body armor and using a blow torch. This brings us to the first of three major questions about this incident: 1. Why would someone try to use a blow torch to open up an ATM? At best it's inefficient, but at worst it's incredibly dangerous (hence the body armor, I guess). When officers arrived on the scene, the suspect attempted to peppery spray one of them and missed. He then proceeded to ditch his back pack (which held the blow torch along with a large knife and a stun gun) and ran away. That brings up to our next question: 2. Out of all the weapons the criminal had at his disposal, why did he go with pepper spray? Look, I'm glad he didn't use any of them since it would have hurt the officer, but seriously...why even pack a large knife and stun gun if you're not going to use them in the first place? Also, if this guy has played any survival/FPS games at all in the last decade, how could he not know about the whole 'Pepper Spray + Blow Torch = Awesome Flamethrower' trick? "...or just peppery spray. That should work, too." Once the police caught up to the suspect and apprehended him, they discovered that 32-year-old Mark Fischer was not only heavily armed, he was also well protected downstairs...with homemade armored underwear. The protective undergarments are strange enough on their own, but they beg an even bigger question: 3. What the hell happened to this guy that caused him to be so paranoid/defensive about his junk? Keep in mind that the primary instrument being utilized in his attempted heist was a blow torch. The trial-and-error possibilities he may have gone through before that day are almost enough to make you feel sorry for him. Unfortunately for Mark, the police weren't in a sympathetic mood. Mark Fischer was arrested and charged with being a felon in possession of body armor (? ), first-degree attempted aggravated theft, attempted assault on a police officer, third-degree attempted escape, interfering with a peace officer, menacing, and possession of burglary tools. 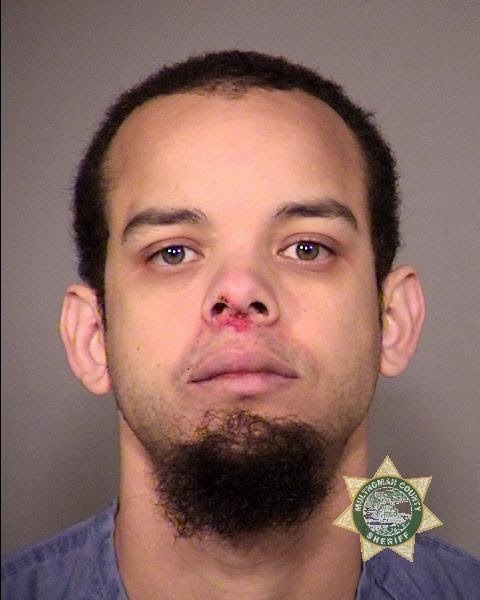 He was booked into the Multnomah County Jail, where he currently awaiting trial. ...and plotting revenge on Murtaugh and Riggs. To get updates on when new articles or podcasts are published (and occasional random musings) 'Like' the official RamblingBeachCat.com Facebook page. Every time someone does, an ATM thief decides that loudly burning a hole through dense plastic isn't the best way to make a score.